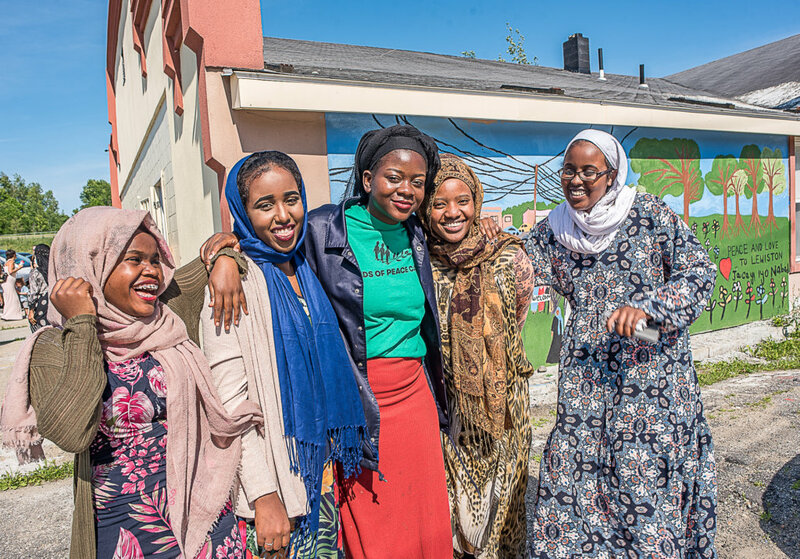 The members of the mural project by 21st Century Kids — Mahado Abdullahi, Aisha Abukar, Hani Ali, Elmoge, Sahro Dakane, Isnino Hamsa, Nurto Ibrahim, Sumaya Mohamed and Bilane Elmi — completed their third mural on the side of the Maine Immigration and Refugee Services building at 256 Bartlett St. The first was done on Lisbon St., according to Shannon Martineau, site director for 21st Century at LHS, but it was not created with permanent materials. The second is inside the YWCA. The mural on the MEIRS building is the result of 12 months of research by LHS students, who dived into immigration’s history in Lewiston. Martineau said she was approached by members of MEIRS, who had seen the group’s other murals in the city and asked to be the site of another hopeful image. Elmoge, also a member of Seeds of Peace, said her favorite part of the project was learning about the different cultures that have come to Lewiston over the years. In addition to research, Abukar said a good amount of imagination went into the mural. The mural depicts a park scene with a variety of cultural traditions, displayed by smiling people from all over the world. Abukar also traveled to Denver for the URBAN youth conference, where she presented the mural project to other attendees.